Check out my Post from May 11 about Micah the miraculous Maltese. A doctor fell and hit her head. She suffered some brain damage in the process. 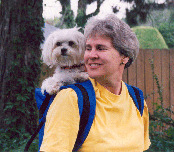 She got a Maltese named Micah who helped her to stay "alert" when she wasn't. For example he would nudge her when she was roller blading if she was about to bump into someone. Pretty amazing huh? any thoughts? Jump right in! Don't be shy.